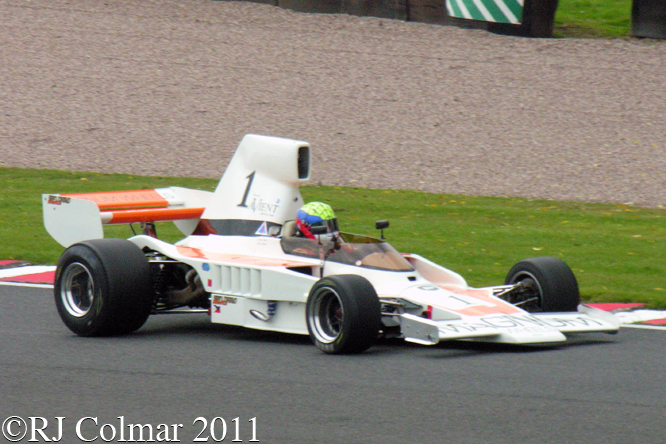 Towards the end of 1973 although the Lola T330 had not won any Formula 5000 (F5000) championships outright, though one had been used to assist Jody Scheckter win his US F5000 title alongside his Trojan, the Lola T330 was rapidly becoming the fastest car on the US and British circuits when the company sold it first improved T332 models with fashionable tall airbox and a rudimentary body extension over the motor to the rear axle. 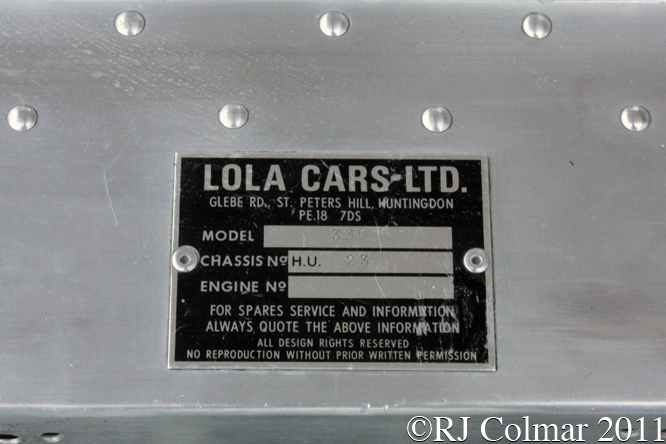 Today’s featured car has a history complicated by the fact that the T330 #HU23 chassis plate was actually fitted to a T330 bought in July 1973 by Australian Johnnie Walker and fitted with a Repco Holden V8. After Johnnie severely damaged his T330 at Surfers Paradise in September 1974 he replaced the chassis with a new T332 type, but stuck the T330 HU23 chassis plate on it. 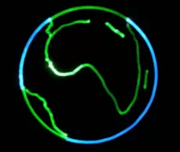 Possibly to save himself some import taxes. The de-plated T330 chassis was subsequently repaired and is now referred to by experts as T330 HU23(A) while today’s feature chassis is referred to by experts as T330 HU23(B), for the purpose of this blog I shall continue to refer to today’s featured chassis as T330 HU23 as there will be no further reference to the de-plated chassis crashed at Surfers Paradise. Still using the salvaged Repco Holden V8, Johnnie was a regular top four finisher in the 1975 Tasman series winning at Surfers Paradise which made him a title contender, in today’s featured car, two races before the series finale at Sandown Park. At the finale, with the title all but wrapped up, Johnnie started from pole before crashing when his car inexplicably turned left on the back straight on the opening lap. 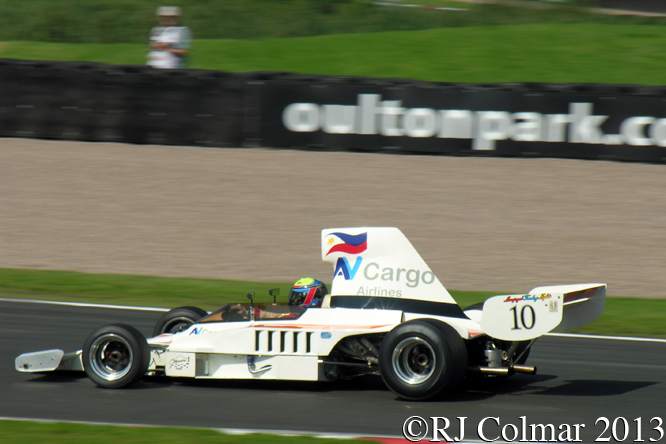 Johnnie rebuilt the HU23 and continued to race the car until February 1976. Peter Edwards bought HU23 in 1977 and continued to race it with a Chevrolet motor, similar to the Small Block Chevrolet seen above, until 1982. Peter sold HU23 on to Bernie Van Elsen who had HU23 stripped and the parts, including the motor but excluding the chassis, fitted to the Veskanda Group C sports car being built in Adelaide by Dale Koennecke and Harry Aust of K&A Engineering with help from former ex VDS Can Am engineers John and Bob Murphy. After selling his car Jonnie drove a Lola T330 belonging to fellow competitor Max Stewart in 1977 but that only lasted until Max was killed driving his Lola T400 during a practice session at Calder Park in October 1977. In the aftermath of the tragedy Johnnie entered into an agreement to race the Lola T332, actually plated T330 22 by former owner Kevin Bartlett, in the Magnum Wheels livery of owner Martin Sampson until they won the Australian Gold Star series, after which both agreed they would retire from the sport. Note the 1979 Sandown Park race was also the same one in which Kevin ‘KB’ Bartlet crashed the Brabham BT43 I featured last week and that Jonnie Walker is seen driving Martin Sampson’s Magnum Wheels Lola T332, T330 HU22, in the background of the photo of Kevin before his crash. That Lola T332, T330 HU22, is obviously not the same one as T330 HU23 featured in today’s post, as I incorrectly believed it to be last week. 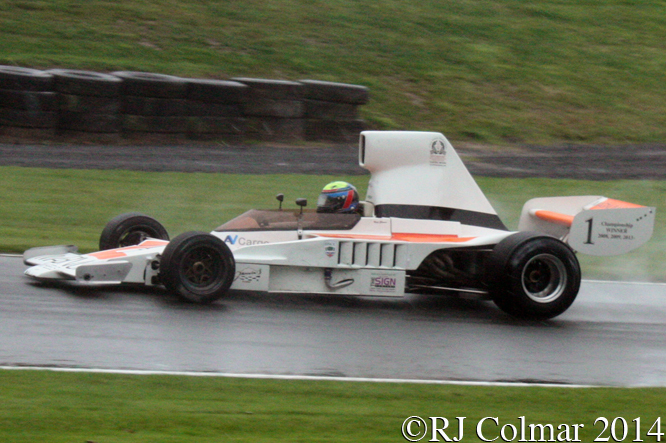 Chassis T330 #HU23 appears to have been restored by Hall & Hall in 2001 and has been raced in the white and orange Magnum Wheels livery of Martin Sampson by Neil Glover who is seen at the wheel in these photographs, all taken at Oulton Park, since 2007. Last year, 2013, Neil won the Derek Bell Trophy with the car. My thanks to Ray Bell, author with Tony Loxley of F5000 Thunder, for his infinite patience with my infinite dumb questions, to both Ray and Lee Nicole at the Nostalgia Forum for giving me a run down of some of the differences between a Repco Holden and Small Block V8 and to facebook acquaintances,Tom Rosenthal, Peter Brennan, Phil Straver, Stephen Morici, Dave Hudson, Sam Henderson, Dave Wolin, John S Buckley, Peter Phillips, Rob McDonald, Graham Wadsworth, Tim Meehan, Derek Kneller, Steve Price, Cliff Bennett, Darren Ciantar, Rory McDonald, Danny Fondren and Bill Sherwood. This entry was posted in Uncategorized and tagged Bartlett, Bell, Bennett, Brennan, Buckley, Chevrolet, Cianter, Colmar, Edwards, F5000 Thunder, Fondren, Glover, Hall & Hall, Henderson, Hudson, K&A Engineering, Kneller, Lola, Magnum Wheels, McDonald, Meehan, Morici, Nicol, Oulton Park, Phillips, Price, Psychoontyres, Ralph, Repco Holden, Rosenthal, Sampson, Sherwood, Stewart, Straver, T330 HU22, T330 HU23, T332, Van Elsen, Veskanda, Wadsworth, Walker, Wolin on December 14, 2014 by Ralph. Back in the 1950’s US Mercedes Benz importer Max Hoffman is credited with encouraging Daimler Benz AG to build the Mercedes 300 SL (W198) based on the successful 1952 Le Mans Winning 300 SL (W194). Chuck Porter amongst a few other US racing drivers took wrecked 300 SLs and turned them into full blown race cars giving them the ‘SLS’ moniker. 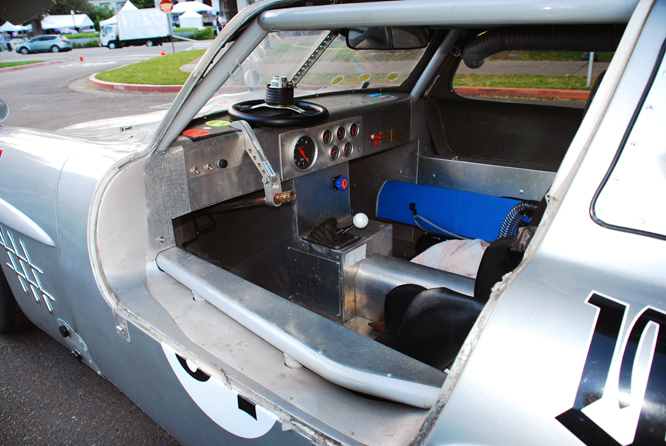 The body of today’s car owned by multi championship winning driver and owner Dave Wolin is thought to have possibly started as such a project. The body is said to have been abandoned in a San Gabriel Valley back yard for 50 years after incurring the legal wrath of Daimer Benz AG for being too close a copy of the original. When Dave found the body it had a tree growing in it ! 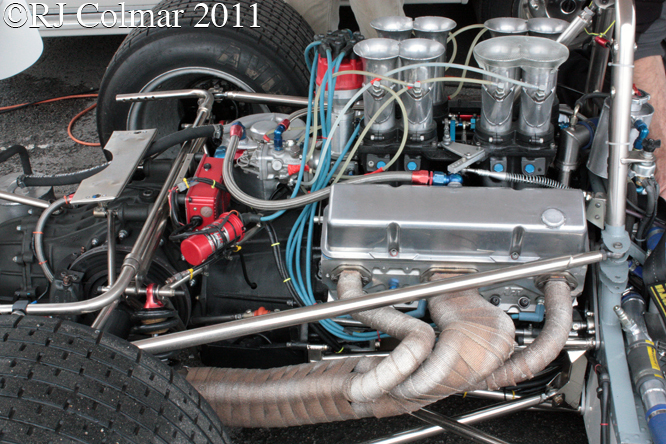 After the body was rejuvenated it was fitted to a modern chassis powered by a Chevrolet small block crate motor. 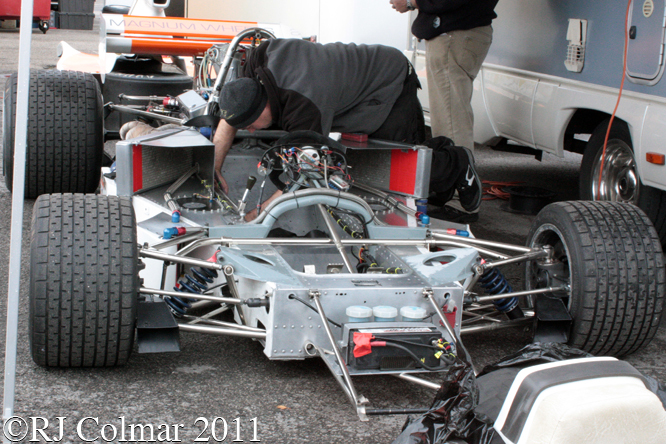 The power is transmitted through a four speed Richmond T 10 gearbox and Speedway Engineering Quick Change rear axle. 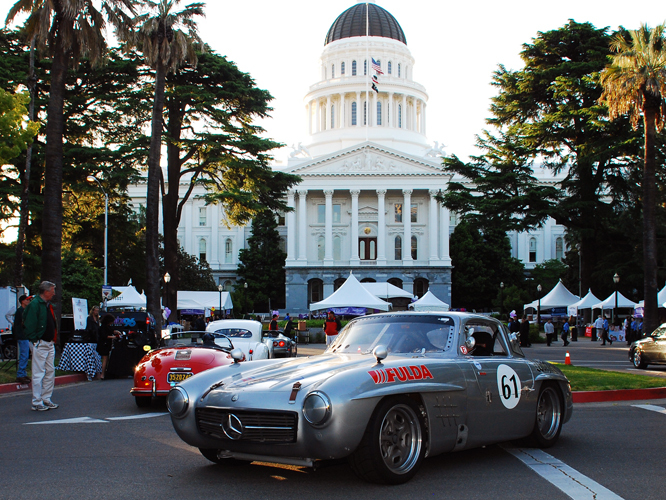 Dave successfully competes with this cool car in races, hill climbs and surprisingly, given that he modestly calls his Merc a 50 Footer*, also enters his Mercedes into Concours events such as the Sacramento State Capital Concours as seen here. * Looks good from 50 feet but it’s a racing car not a show car. My thanks to Geoffrey Horton for the photos, for introducing me to Dave Wolin and to Dave for the additional photos and information about this ultra cool 300 SL. I hope you have enjoyed todays Gull Wing edition of ‘Gettin a lil’ psycho on tyres’ and that you will join me again tomorrow for a trip to the Donnington Park Museum. Don’t forget to come back now ! PS Recommend aficionados of the 1930’s era Silver Arrow’s visit my friend Paul Chenard’s blog about his limited edition book ‘Silver Clouds‘ on the 1934 season. 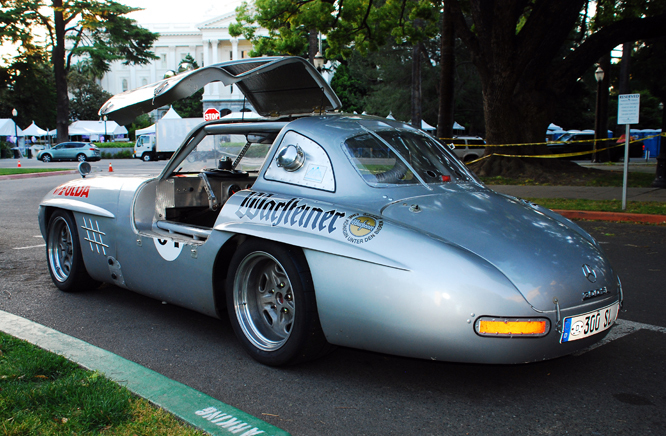 This entry was posted in Uncategorized and tagged 300, Art, Capital, Chevrolet, Concours, Dave, GALPOT, Geoffrey, Gull, Hoffman, Horton, Max, Mercedes, Sacremento, SL, State, Tidesco, W198, Wing, Wolin on July 3, 2011 by psychoontyres.